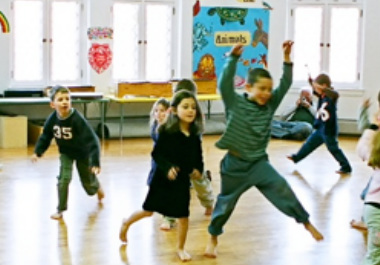 Dalcroze Eurhythmics, developed by Swiss composer, pianist and educator Émile Jaques-Dalcroze, is a unique, exciting, and powerful education in music for children and adults. Rhythmic movement, active listening, and improvisation unlock creativity, nurture imagination, and open the doors to enriched and enlivened music making. Musical concepts are explored through social and interactive games that invite the students to trust their ideas, develop their own intuitions and deepen their musical knowledge and understanding - all through the spirit of play! In a typical class of Eurhythmics (literally, good rhythm), rhythm games, songs, gesture, and movement will be combined so that the joy of music is experienced as well as understood. 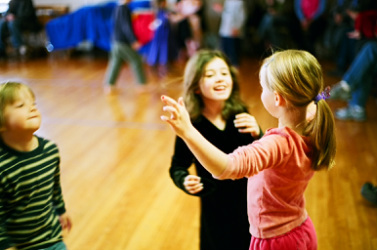 The goal of a Dalcroze classroom is not to have a student say, “I know” but to have a student say, “I have experienced!” As a precursor to or in tandem with private music lessons, Dalcroze Eurhythmics will create a platform for accelerated and deep musical learning for all. As a recipient of in-depth Dalcroze training in the Conservatory at the Longy School of Music (where I received both my Dalcroze Certificate & Licensure) and as a professional studies student at the Dalcroze School of the Rockies, I teach classes to ﻿children﻿, adults, and seniors in the Rocky Mountain Region and via Skype Lessons. If you're interested in Dalcroze based musicianship lessons, via Skype, or Eurhythmics, Solfége, and improvisation lessons in person, please click here for more information.